Saline water kills most plants because the salt or sodium in the water prevents moisture from adequately entering the plants' roots. 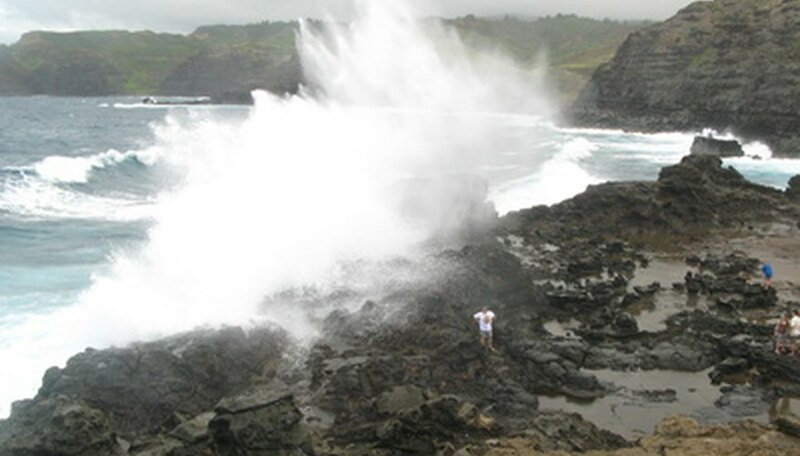 Gardeners who live near bodies of salt water often find that sea-spray kills most plants. Additionally, poor water management practices worldwide have increased the salinity of aquifers and other freshwater sources, making it necessary to find plants that can grow in saline water. Some trees are able to tolerate higher concentrations of saline than others. For example, mangroves spend part of the season partially submerged in brackish water. Other trees that are suitable for saline environments include acacia trees, red and black oak trees, and some types of eucalyptus. Many palm trees also do well in places with saline groundwater. According to “Hort-Pro” magazine, in regions where the salinity of the soil is affected by runoff from pavement where salt was used as a de-icer, salinity tolerance is higher in trees like European and white ash, most types of magnolia and conifers like ponderosa pine and Colorado blue spruce. Shrubs are an effective wind block from blustery ocean breezes, but not all types can survive the salt in the sea-spray. Evergreen shrubs like juniper and bayberry can withstand harsh, salty winds, as can flowering shrubs like oleander and bougainvillea. Gardeners in New Zealand have had success with hardy shrubs like saltbrush and several varieties of banksia. These shrubs also have the advantage of not needing much water. Even some flowers can do well with saline water. Flowering cacti and succulents are all good candidates for planting in salty areas, and they are also drought-tolerant. Ice plant produces striking fuchsia flowers and is an effective ground cover for erosion control on sandy soil. Other flowers that grow in saline water include sunflowers, groundcover gardenia and hellebore. Statice, also called sea flower or limonium, can even be grown successfully for market along the highly saline Dead Sea coast. In developing countries where drought is common and fresh water is lacking, it is becoming increasingly necessary to develop strains of saline-tolerant food plants. “Dawn” magazine points out that Pakistani researchers have successfully created strains of beets, spinach, sugarcane and rice that grow where the saline water table is high. Fruits like date palm and coconuts can also be grown in saline environments, as well as oil crops like rapeseed and livestock fodder such as sweet clover, white clover and lucerne. Daily Press: What Plants Tolerate Salt Water Flooding?